PRISCILLA has overcome a lot to get where she is today. She may have lived on the streets for a while and was not in good shape when she was first rescued, but she has been in a loving foster home for a while now where she has gotten the attention and care needed. She had surgery for hernia repair that most likely resulted from a bad pregnancy and trying to push out a litter of pups. She tested light heartworm positive but has successfully completed treatment and is now heartworm negative. She is a healthy dog, energetic for her age, and her foster's favorite Pretty in Pink diva. She is current on vaccinations, microchipped and spayed. She weighs 45 pounds. She is friendly with humans of all ages 8 and above. We have not observed her with children below 8 years. She will bark at other dogs but has shown no aggression. She gets along fine with the cats at her foster home. She does not like her paws being touched or held, however she is making progress with that through training and otherwise, she loves being petted and likes attention and affection from people. She likes car rides. She is crate trained and house trained. If you live in another state, don't let that stand in your way. 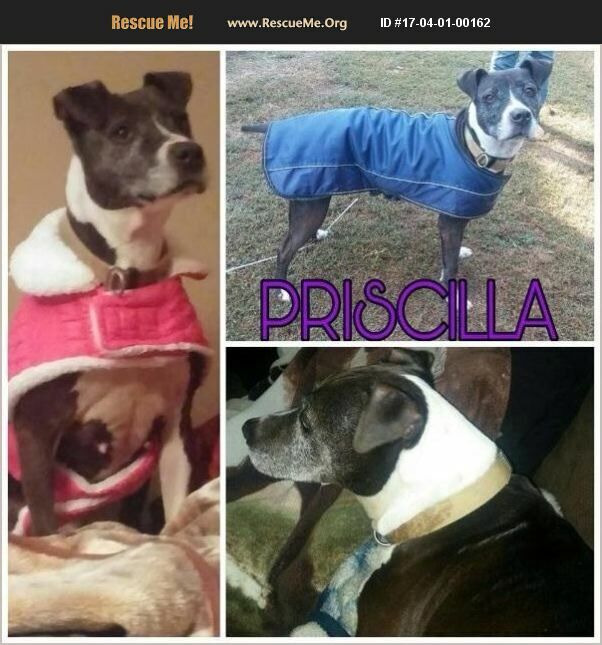 We will work to transport Priscilla if it means she will have a good forever home. If you are another rescue group, we will waive the adoption fee but you can make a donation toward vetting at your discretion. The adoption fee will help our 501(c)(3) non-profit rescue to cover part of the cost of the veterinary care she has received.